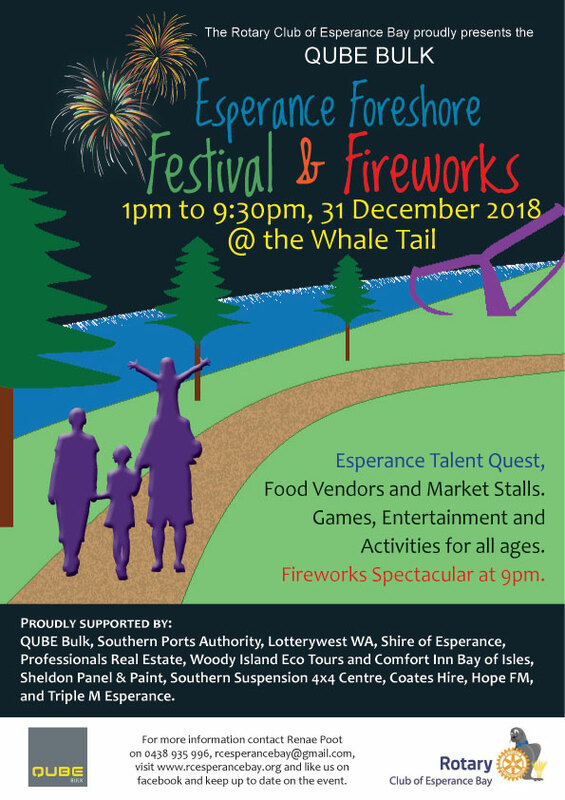 Esperance Foreshore Festival and Fireworks 2018. This family friendly community event will be held on Monday 31st December 2018 commencing at 1:00pm with entertainment and games for all ages, food vendors and market stalls and culminating in a spectacular Fireworks display at 9.00pm. 2018 is the fifth year the RCEB has facilitated a fireworks show for the Esperance Community on New Year’s Eve with generous support from local businesses and individuals. The aim of the RCEB is to facilitate an event that is not only for locals, but will attract visitors from out of town and showcase our amazing community. Feedback from participants indicates that they want more of a community event prior to the fireworks with food and drinks and things ‘to do’ - so we are delivering! The EFFF2018 committee hopes we have achieved this with the generous support of our sponsors: QUBE Bulk, Southern Ports Authority, Professionals, Lotterywest, Professionals Real Estate, Woody Island Eco Tours, Sheldon Panel and Paint, Shire of Esperance, Southern Suspension 4x4 Centre, Coates Hire, Hope FM, and Triple MMM 747 Esperance. Please come along, enjoy the fun, comradery and competition. Come participate with YOUR community in the many activities provided. 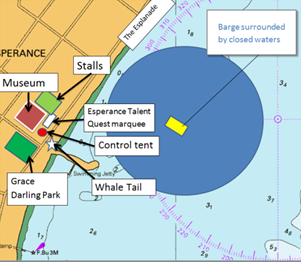 QUBE BULK Esperance is pleased to join the Rotary Club of Esperance Bay as the naming rights sponsor. Qube Bulk have established themselves in Esperance as the leaders in Mine to Market logistics solutions. Qube provides road haulage, bulk and containerised storage and shiploading for the regions bulk commodity producers. Qube understands the value of supporting and investing locally and are proud to announce our sponsorship of the Rotary Club of Esperance Bay – Esperance Foreshore Festival & Fireworks 2018. Qube Bulk have established themselves in Esperance as the leaders in Mine to Market logistics solutions. Qube provides road haulage, bulk and containerised storage and shiploading for the regions bulk commodity producers. 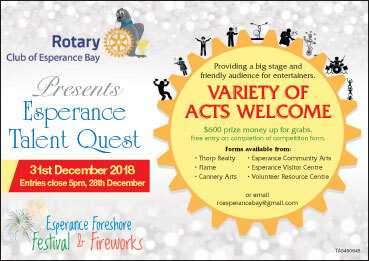 Qube understands the value of supporting and investing locally and are proud to announce our sponsorship of the Rotary Club of Esperance Bay – Esperance Foreshore Festival & Fireworks. Qube prides itself on local community involvement through employment and sponsorship of sporting clubs, charities and school education programs. The opportunity to be involved with the Rotary Club of Esperance Bay reflects Qube’s commitment as a community member and local business with professional leaders who take an active role in the region. Qube’s continued investment in Esperance with industry first innovations reflects increasing demand from our customers and highlights the potential for growth in the region. Qube Bulk Pty Ltd is a wholly owned subsidiary of the ASX100 publicly listed company Qube Holdings Limited (ASX:QUB). Please leave your DOGS at home. They can get very upset by the fireworks. Come and create – multiple colours. Marbles, Croquet, Tic-tac-toe, Yo-yos, Skipping, Hopscotch and other games of yesteryear. All ages – go your hardest! Fees apply. Small children must be supervised. Colouring in competition, water sports and ETQ winners. Bigger and better this year.